This has been an increasingly active year in farming & gardening happenings in New Orleans. Despite the cold weather, lots is still happening in December, so be sure to get out and support your local farms and food organizations! Classes/Workshops: As usual, Southbound Gardens is hosting a variety of workshops this month. Look out for their Basics of Beekeeping, Organic Bug Management, and Urban Composting workshops. Grow On will be hosting a Seed & Plant Winter Workshop on the 11th, and if you’d like to learn how to grow your own winter greens in a container garden, then you can also attend Longue Vue House and Gardens’ workshop on the same day. Parties: There are lots of fun garden parties happening on Saturday, Dec. 10th! Press Street Gardens will be hosting their Winter Informal, where you can buy locally sourced holiday decor and food preserves. Also, Nola Tilth will be celebrating their new garden space with a bonfire, music, cocktails, charbroiled oysters, and there will be plants and gift items for sale from CRISP Farms and others. Every Sunday, Hollygrove Farm & Market will be hosting a Brunch in the Garden party. Look for different vendors selling locally sourced items, and the market will also be selling their satsuma sparklers, cheese plates, and French Truck coffee. Volunteering: Every Wednesday afternoon, Press Street Gardens hosts an open garden time for volunteers. You can also volunteer at ReFresh Community Garden’s Volunteer for Veggies programs on Tuesdays (in Spanish), Wednesdays, and Fridays. Markets: There are now farmers markets happening six days a week in New Orleans! On Mondays, head over to the ReFresh Farmers’ Market, on Tuesdays, Wednesdays, Thursdays, and Saturdays, the Crescent City Farmers Market hosts a market in a different part of town each day, and on Sundays check out the brand new Marche Creole Community Market! Plant Sales: As usual, you can always depend on Southbound Gardens for their gorgeous plant starts. They have a plant sale every Sunday at their greenhouse, and this December they are hosting one on Saturdays as well! If you would like more information about these events, please check out our Community Events Calendar. 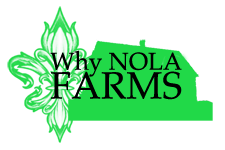 We update it often, and it is where you can find all of the farming/gardening information for New Orleans events in one place! Please feel free to contact us at whynolafarms@gmail.com if you would like your local food event posted on the calendar!